Suggestion: Baku also makes your Hero Power cost (3). Genn also downgrades your hero power. Do you think it's time for Battle Royale mode? 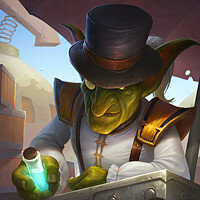 They could, however, simulate the auto chess experience.A draft format that has the computer play both characters and auto play cards based on maximum curve use. After each match (which could be made much faster than we play) you purchase more cards for the deck. Like a living dungeon run against other players with the caveat you are planning around how the computer will decide its turnsEdit: make each match time limited with final health, then final board decide winner. First game is 4 turns, 2nd is 5, ext until someone wins their, say, 5 or 10 man bracket. 02/19/2019 05:10 PMPosted by WardrumNext time you get owned by a [literally any card I don't like], remember me and how wrong you were.See how easy that is?What happened to happy productive Right? You've been resorting to cheesy trolling stuff more and more lately.Well...The meta HAS been full of high power level spikes and from hand lethal for a year now.It's enough to make anyone hyper sensitive to it.